Bayfield High School’s David Hawkins competes in the shot put on Saturday at the Abel Velasquez Invitational at IHS. Hawkins broke his own school record in the event. It was certainly a Saturday to remember for three athletes of the Bayfield High School track and field team, as six school records were set at the Abel Velasquez Invitational at Ignacio High School. Jordan Lanning set four school records, while David Hawkins and Mikayla Barnes broke their own school records in the shot put. Lanning, a senior, set a new school record in the 100-meter hurdles, after she won the event in 14.98 seconds. She followed it up with a 12.65 in the 100-meter dash. Lanning also excelled in the field events, after she set two more school records, with a 5-foot, 9-inch jump in the high jump. She also had a 17-foot, 7-inch jump in the long jump to win. She won all four events she competed in. 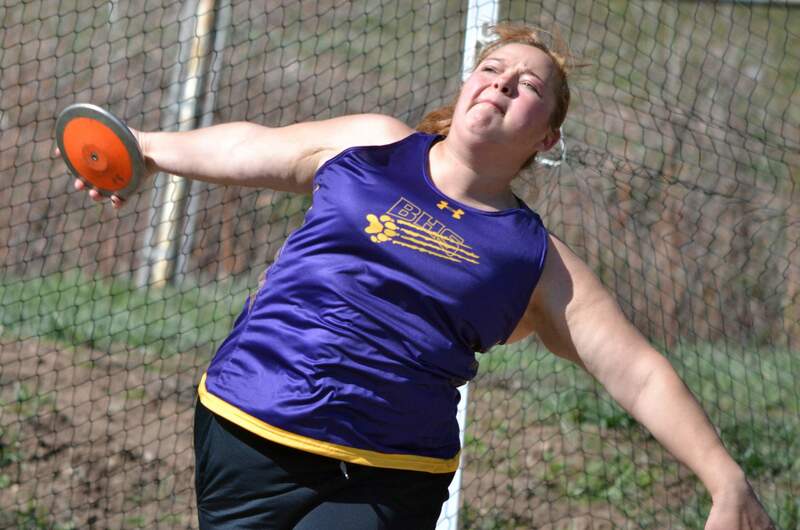 Bayfield High School’s Mikayla Barnes competes in the discus throw on Saturday at the Abel Velasquez Invitational at IHS. Barnes broke her own school record in the shot put. Hawkins broke his own shot put record, after he threw 53-feet, 8-inches, while Barnes had a throw of 36-feet, 5-inches, as both won their respective events. Hawkins’ throw is currently the top in Class 3A, while Lanning has the No. 1 time in the 100-meter dash and top jump in the high jump, while she has the No. 2 time in the 100 hurdles and No. 2 jump in the long jump. Her high jump is tied for the 11th best mark in the nation for the outdoor season. Durango won the girls title with 121 points, while Pagosa Springs won the boys title with 109. The Wolverines took second in the girls team score with 92 points, while the boys were fifth with 58.50 points. BHS will host the Pine River Invitational on Saturday. 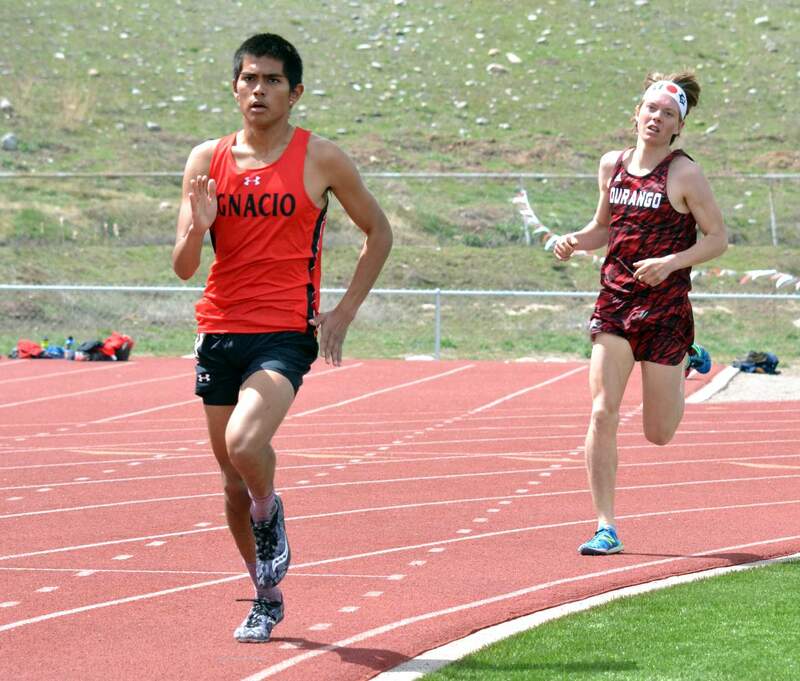 Ignacio High SchoolThe Ignacio High School track and field team had eight top-five finishes at its home meet on Saturday and both the boys and girls teams had winners. Lexy Young won the 200-meter dash with a time of 28.48, and took third in the 100 and crossed the line in 13.88 seconds. Charlize Valdez took fourth in the 1,600 (6:04.28). Ignacio High School’s Elco Garcia competes in the 1,600 event at the Abel Velasquez Invitational on Saturday at IHS. Garcia won both the 1,600 and 3,200 events. On the boys side, Elco Garcia won two events, the 1,600 (4:52.07) and the 3,200 (11:16.80). 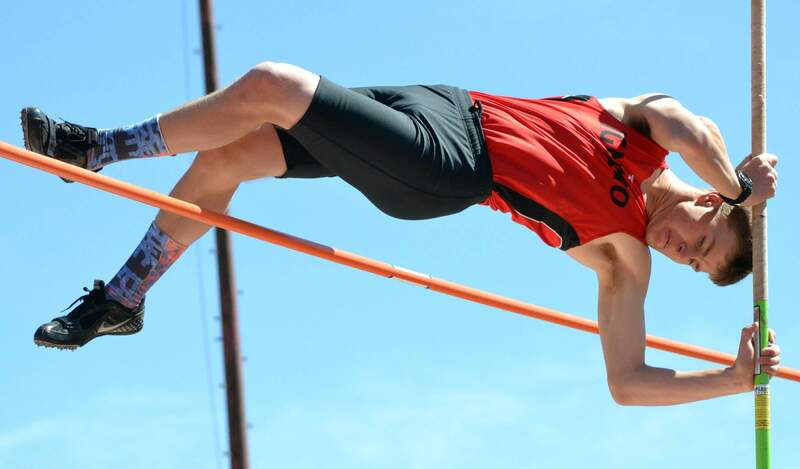 Other strong finishes came from Joseph Atencio, who finished in fifth in the 200 (24.55), while there were two top-five finishes in the pole vault. Jason Hampton-Foutz vaulted to a height of 9-feet, 6-inches and took second, while Tyler Barnes was fifth with a height of 8-feet, 6 inches. Ignacio High School pole vaulter Jason Hampton-Foutz clears the bar on Saturday at the Abel Velasquez Invitational at IHS. Hampton-Foutz finished in third. The Bobcats finished in 10th on the girls side with 21 points, while the boys took seventh with 32. IHS will also be competing at the Pine River Invitational on Saturday in Bayfield. 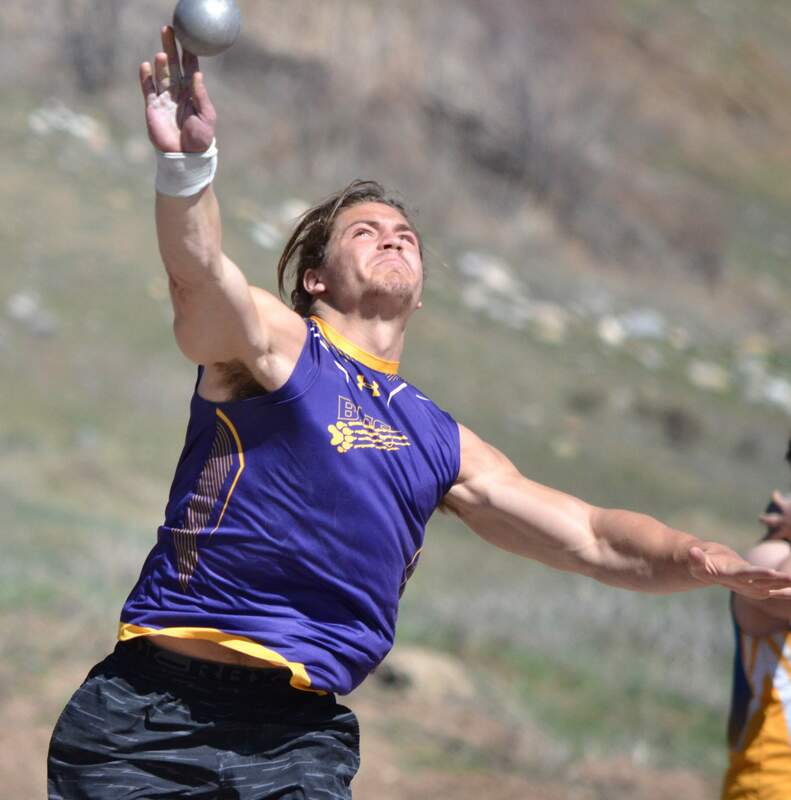 Durango High SchoolThe Durango High School track and field team made its first trip up the Front Range on Saturday for the Mullen Invitational and had plenty of good performances against other top-ranked programs from across the state. Final team results were not available. On the girls side, Cassandra Blau tied her personal record in the 100-meter dash after she finished in ninth-place with a 12.73 and also set a new personal best in the 200-meter dash with a 26.43 and another ninth-place finish. She qualified for the state championship with both of her times. Alyssa McConnell recorded a 5-foot, 3-inch jump in the long jump, which qualified her for the state championships, as well. McConnell tied for first alongside Hailee O’Neill from Douglas County, who had the same jump. There were plenty of other solid performances and head coach Johnny Bertrand was happy with how the Demons did. Bekah Moenning ran a 59.90 in the 400 and took seventh. Other top finishes included Madeleine Burns, as she ran a 5:10.94 in the 1,600. On the boys side, Maxton Warman had a personal record in the 400 and crossed the finish line in 52.64 seconds for 13th overall. Alex Hise finished in ninth in the 100 (11.18), while Marcus Flint finished in fourth in the 3,200 (10:12.53). Hise took third in the long jump, with a jump of 21 feet, while Martin Cuntz was ninth after he jumped 20 feet, 4-inches. Durango will travel to Bayfield Saturday for the Pine River Invitational at BHS.